This afternoon I received an email from Microsoft to tell me that I’d been awarded the 2013 Microsoft MVP Award for ASP.Net/IIS! This is my sixth MVP Award and I’ve mentioned before I am extremely humble to be associated with a great group of less than 5000 technical people around the globe. I’ll be aiming to continue my efforts to help the community and deliver as much content as I can to aid and spread knowledge. On Thursday night I was having an email conversation with Takeshi Eto from DiscountASP.Net about the hosting of my blog. I’ve been hosting my blog with DiscountASP.Net for nearly five years and have been very, very happy with their service – always up to date often offering services faster than other hosters and very quick turn around of support tickets if ever I’ve had any issues – they also host the NEBytes site. I also took the opportunity to upgrade the underlying platform of my blog, BlogEngine.Net, to 2.6.0.5 after not having upgrade from 2.0. At the same time I’ve tinkered with the theme so I can present more content in my posts and I’ve also fixed a number of issues that I haven’t had time to investigate before now, for example my tweets are now displayed correctly in the bubbles above. I’ve got a couple rough edges to smooth down like the search page but everything else seems ok.
First on my list of exams to study for and complete was 70-515: Web Applications Development with Microsoft .Net Framework 4. I had the exam booked for Tuesday 18th January 2011 and I’m pleased to say after a lot of intense and hard swotting I passed the exam. Due to the severe disruption caused by the bad weather on both sides of the Atlantic it became very difficult to get hold of a printed copy of this book when it was due to be available in the UK. There was a digital version available but I still like to read a physical book, although I am being tempted more and more of late by the Kindle. Fortunately I was able to get a copy of the printed book prior to my exam, just! WARNING: I don’t think this would be a useful review if I didn’t stress at the beginning that while this book covers the topics which the exam covers, it should not be your only resource of learning. I made use of my attendance of relevant sessions at User Groups, real world experience on projects and additional reading, such as Steve Sanderson’s excellent Pro ASP.Net MVC 2 Framework, Second Edition which is an excellent book for getting to grips with ASP.Net MVC 2.
eBook edition of the study guide. Developing a Web Application by Using ASP.Net MVC 2. This self-paced training guide was an invaluable tool for me in my preparation for the exam. The guide breaks down the objectives into manageable chunks and highlight areas which need to be covered. The Labs cover each topic as you progress through each chapter. My one major criticism of the labs is that each lab often starts by setting up a new project/solution with the same name as the previous lab which is really frustrating. Personally I would much rather have started a new solution per chapter and modified the solution/projects as I went through the labs in that chapter. The review questions are a great way to review your knowledge and how much you’ve taken in after completing studying each chapter. The Scenario based exercises are even better as they make you think how your knowledge would be applied in the real world. 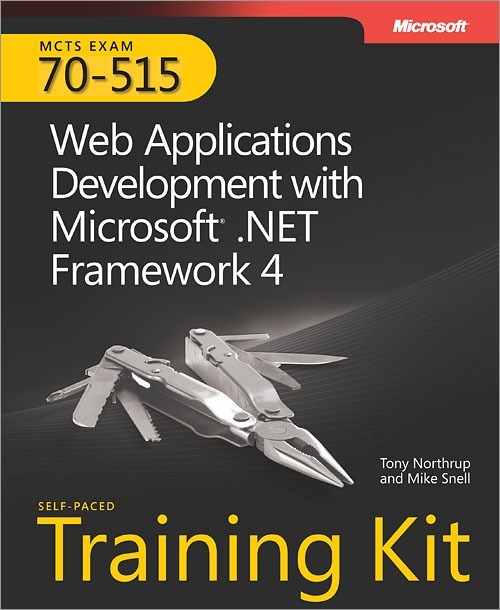 I would recommend buying and working your way through the MCTS 70-515 Web Applications Development with Microsoft .Net Framework 4 Self-Paced Training Kit as part of your preparation for the 70-515 exam, however I would also recommend additional sources to compliment your learning. For example the MVC area was easier for me to pick up as I have completed some projects using the Framework and have also read other books on the topic, whereas the Client-Side Scripting element was harder for me to pick up as I have had less exposure to that area of study. If you’re studying for the 70-515 exam good luck and I hope you find this book and review useful! I’m off to search for materials so I can prepare for my other exams as the equivalent training guides won’t be available for quite some time yet. For full details of the announcement see Scott Guthrie’s blog post and to register visit the WebsiteSpark portal. For more information refer to iis.net and to Bill’s blog post, I’m off to read up on today’s great announcements. Last night Alan Dean came up to VBUG in Newcastle to speak on ASP.Net MVC Framework. One of the discussion points we had was any potential issues for hosting sites on IIS due to the routing and url rewrite elements of the MVC Framework. I wasn't clear on the implications, and I hadn't seen much traffic personally on the issue. So with a task of downloading ASP.Net MVC Framework Preview 5 so I could have a good look at it and understand it all as an alternative to Webforms, and looking into the implications and workarounds for hosting within versions of IIS I went of in search of information. I immediately thought that with IIS7 and applications running in Integrated Mode, which is the mode I aim to run all of my applications on IIS7 in, there should be no configuration changes or modifications required since ASP.Net is part of the pipeline so all requests are processed by ASP.Net by default. In classic mode ASP.Net requests are processed through the aspnet_isapi.dll as they would be in IIS6 so unless files are mapped to the ASP.Net Isapi filter then they wouldn't be processed. In reading up about ASP.Net MVC on the ASP.Net website I found a great tutorial on Using ASP.NET MVC with Different Versions of IIS - hopefully this will be of help to you looking to configure and use the ASP.Net MVC Framework on IIS. RemixUK - Ready Steady Speak Competition! - Win an XBOX 360! Ready Steady Speak is back for the RemixUK Event in Brighton on Thursday 18th and Friday 19th of September 2008. Are you a budding speaker? A Designer with a passion for what you do who would like to educate us Developers in how it's done or some other aspect of design which we really don't get? Are you a Developer who wants to get his message across to designers about just how cool the latest features in Web Development Technologies are or do you just want to share your knowledge with your fellow designers and developers? If so then Ready Steady Speak at RemixUK could be the ideal opportunity! RemixUK is all about the conversation and the opportunity for Web Developers and Web Designers to mix and discuss their roles and technologies and work together to shape the future of the Web!. Ready Steady Speak is a unique way for you to have a go at delivering a short presentation to a very receptive audience of like minded people, and hopefully once you get a taste you'll go on to deliver full presentations or more nugget style presentations at local usergroup events, Barcamps etc around the country! I've presented at a number of events and conferences now and the Buzz is amazing - so I very much encourage you to have a go! If you have any questions or doubts email me - using the contact form on this blog and I'll do everything I can to help you! Contestants will present a 5 min session on a subject of their choice relating to Web Development or Web Design. They will present in front of the REMIX audience and in front of a panel of judges. If there are more than a certain number of contestants (TBD), there will be ‘heats’ earlier in the day with the winners of the heats in a ‘speak-off’ in the evening session. The ‘speak-off’ will take place as stated in the evening of the first day of MIX and the first prize is an XBox 360 + Goodies! · Speakers must NOT have previously presented ‘full sessions’ at DDD, TechEd, DevWeek, SDN, SQLBITS, VBUG Conference, NxtGenUG FEST or any similar such conferences. · Speakers must state their desire to enter the competition by no later than COP Monday 15th September 2008 by email. So come on and have go it'll be a great and very rewarding experience!!! I'm really looking forward to making the very long trip down to Brighton and look forward to meeting lots of new great people! Here is a brief introduction to my session IIS 7 for ASP.net Developers which I will be presenting at IMTC 2008 in Dublin on Friday 4th April 2008 at 11:30. Recently VBUG Vice Chairman Tim Leung, prepared a brief video about the work we do at VBUG and the support we give developers in aiming to achieve our goal of Developing the Developer!, for the Microsoft VS08/SQL08/Server 08 Launch Event in Birmingham. We didn't want to waste all of Tim's hard work and not use the video for anything other than the launch event, so last night I took a look into how we could stream the video using Silverlight and was surprised to see how easy it is :). First I was concerned with bandwidth usage, yes it's a small video but still I didn't have any idea of how many view it would receive, but then I remembered that Microsoft are offering Silverlight hosting as part of the initiative to get developers working with the technology. They provide 10GB of storage for videos and applications with an aggregated 5TB of Bandwidth per user account per month. All you need to get an account is a Windows Live ID. 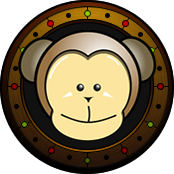 So off I headed to silverlight.live.com and setup an account :). Next I uploaded our video. From here you can choose to create an application for your content. I didn't have time for this and to be honest I haven't had chance to do a great deal with Silverlight yet. So then I was stumped at how to embed our video on our pages at www.vbug.com but then whilst managing my uploaded video I noticed that it offered a code snippet with details of how to insert an iFrame into any web page, so off I went and copied this snippet into our VBUG home page and voila we now have streaming video content on our web site. I've also put the video here at the bottom of this post, to demonstrate how easy it is and to answer a few questions about what VBUG is and does. Let me know what you think :). I managed to get hold of this book a few months ago, about the time I flew out to Tech Ed in Barcelona. Unfortunately it's taken me till now to write up my impressions and views on this book. Initially I was a little apprehensive about reading this book due to two particular reasons: firstly I don't generally get along with Wrox Press books and in the past have found them difficult to read compared to other titles from other publishing houses; secondly this book is a considerable size - totaling 670 pages!! 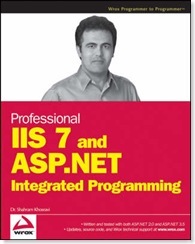 I was however eager to read it, as I am any new titles that appear on the subject of IIS 7. This one had particularly grabbed my attention due to it's initial indications of specific relevance of how to exploit the power of IIS 7 in ASP.NET Applications and Programming. In essence I would say that this book is a must have on the bookshelf of any serious ASP.NET developer who is looking to exploit and use the full power of IIS 7 in their applications. As opposed to a previous title I reviewed - Book Review: IIS7 Implementation and Administration - this book is most definitely aimed at the Developer. There are only 12 chapters in this title however they are very detailed chapters and really go into great detail. Topics covered include using the integrated configuration system (<system.webserver>), how to extend the configuration system, extending the management interface, extending the request pipeline and it even has a great chapter on the integration of WCF in IIS 7 - something which I've been looking for good sources of information on. What is great about this book is how in each element Dr. Khosravi has gone into immense detail and broke down each part of the object model and configuration model, explaining the effects of each option and the affect that can have on your application and the web server itself. This is a feature which I and I would imagine many others will turn to over and over again as new requirements appear in my/their projects. 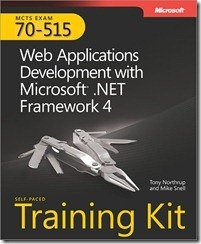 Although initially the content of this book can be daunting to a beginner in time they will grow in knowledge along side this book, and it is a title which can be constantly revisited and digested at the reader's own pace, this is a must for any IIS/ASP.NET Developer's bookshelf. In response to my initial two concerns about this title, I've been convinced. I enjoyed reading this book and possibly my reading style and ability has improved/changed since I last read a Wrox title, but I didn't have a lot of problems reading this book, although the content can be quite heavy going as it is so detailed, which I've already identified as a strength. The size of the book is also of no problem and indeed is vindicated in the quality of the content.